This past weekend saw the Coronation Festival in the gardens of Buckingham Palace, at which holders of royal warrants exhibited. The royal warrant is not exactly the mark of quality that some might assume, given that it includes Austin Reed and Daks among its clothiers. 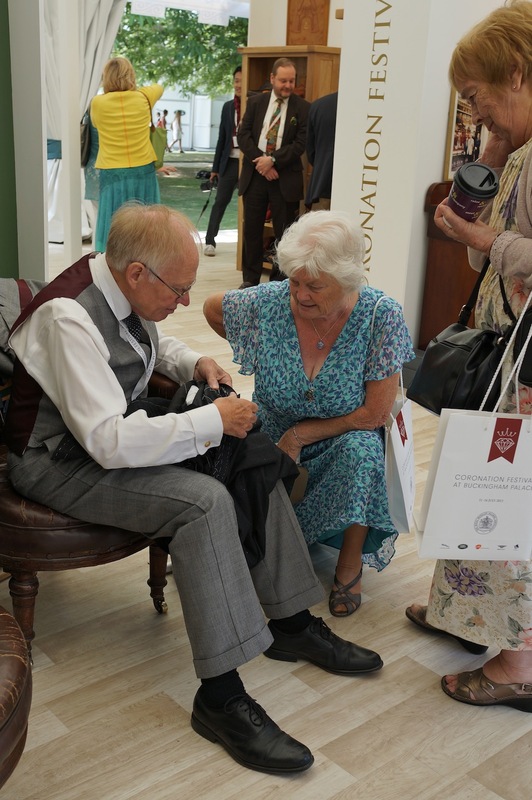 But bespoke tailors at the event included Gieves & Hawkes, Henry Poole, Benson & Clegg, Dege & Skinner and Kent Haste & Lachter, as well as Permanent Style favourites such as John Smedley, Corgi, Swaine Adeney Brigg and Turnbull & Asser. 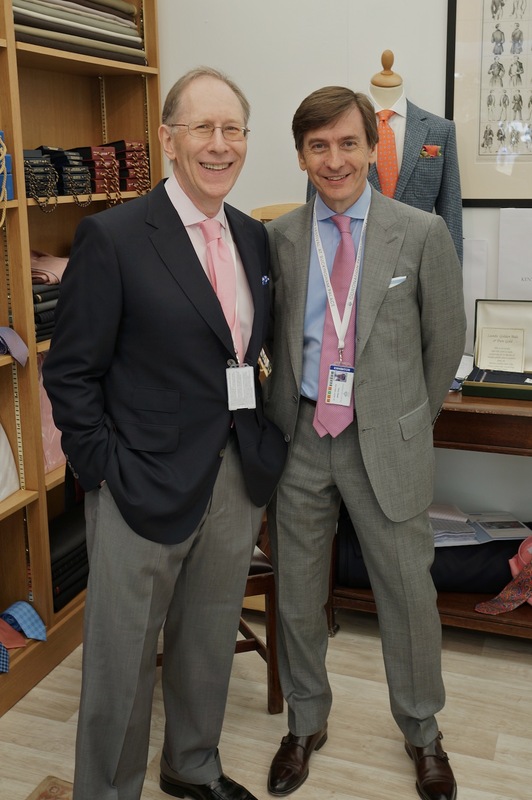 A handful of menswear people were invited to lunch by Gieves & Hawkes, whose stand was probably the best there: an exhibition of 200 years of work under royal warrants, plus a few pieces from the fantastic new Royal Collection. This, Jason Basmajian’s first full collection, is a huge step up for Gieves ready-to-wear: all made by Cheshire Bespoke in England, fully canvassed, English materials, unfinished sleeves/trousers and with alterations available from the bespoke department. Stephen Lachter and Terry Haste on their stand. Henry Poole had some basting work on display. Cue a lovely conversation with some amateur seamstresses. I’m a big fan of Swaine Adeney & Brigg. 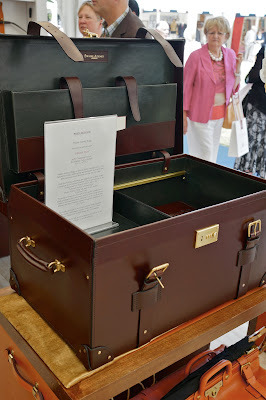 Great English luggage, hand sewn and reasonably priced. This is their Lifetime Trunk, with a selection of compartments and boxes intended to be filled with personal effects and kept throughout one’s life. Launched to tie in with the impending royal baby, of course. He may not have a royal warrant. 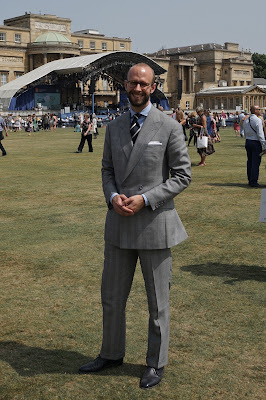 In front of the stage, in Henry Poole 8-ounce DB, Drake’s tie, Satriano Cinque shirt and John Lobb (Paris) shoes. PR James Massey, Luke Leitch of The Times and stylist William Gilchirst. 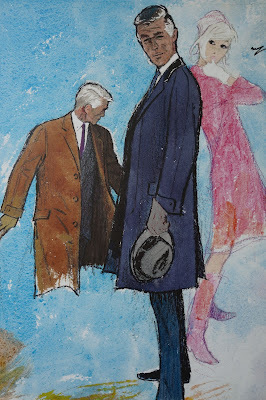 Vintage Daks adverts, on the side of their stand. You can follow the discussion on Royal warrant holders at the Coronation Festival by entering your email address in the box below. You will then receive an email every time a new comment is added. These will also contain a link to a page where you can stop the alerts, and remove all of your related data from the site. 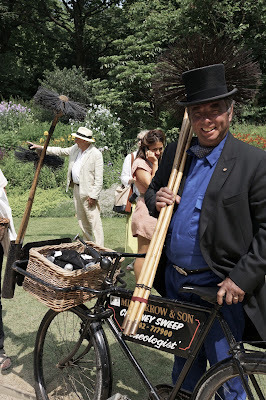 Anderson and Sheppard kwnow to make Prince Charles’s suits do not have any Royal Warrant ? Hi Cyrille – I answered this on a previous post. It’s not as simple as that. It can take years of work to have a royal warrant given (Smedley have only just won one). And everyone who supplies the family doesn’t get one – otherwise they’d only be allowed to have one brand of cheese! 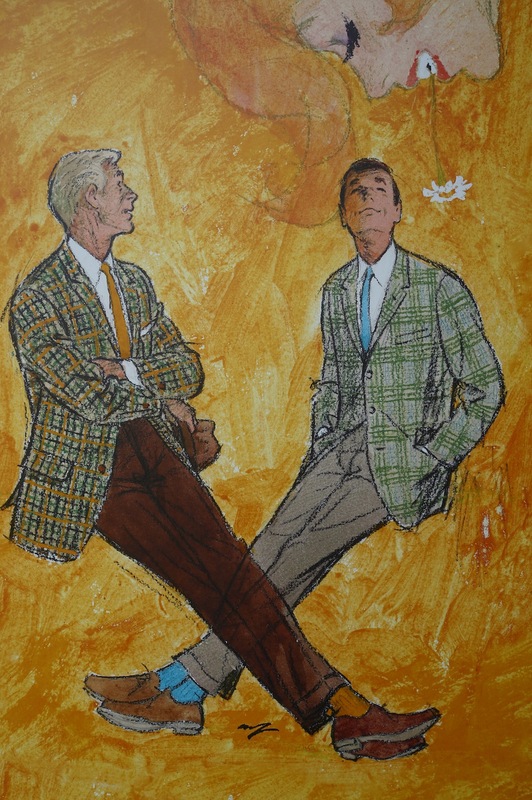 Daks and Austin Reed used to be rather good (in the 60s AR tailored clothing was made by Chester Barrie, for ex) but aren’t any more. Can you explain here, or in a future post, how a royal warrant is obtained, and on what basis? How do you keep one? And how may you lose one? Yes, they were great names that have been undermined. Though why it takes some companies much longer than the five years and a bit is less clear. That link is very helpful but neither that information or that on the royals’ own website explains how the Royal Household Warrants Committee decides to give any warrant-holder the boot. Do investigate! What ever happened to austin reed are they still on regent street! I was wrong about the chimney sweep! Simon, you look so great! That is such an impressive suit you have on. its a lovely suit, and it may just be the way he’s standing, but to me the trousers look a tad too short. I’d love the “lifetime trunk” for Nathaniel! Fantastic idea and what an incredible heirloom. You are so central to all this now that you ought to be consulting the profession on devising a Permanent Style kite mark, won and awarded for outstanding excellence. It would be an objective to win it and a great guide to consumers, hand in hand with all your other great mentoring work, to advise us your on the very best. Like royal warrants, it would be a point of pride to receive the award and something to work towards. That’s very kind Joshua, though with bespoke makers there wouldn’t be that much to tell between them in terms of quality of work – or it would be a fairly arbitrary distinction. Most of the choice is down to style and personality, which again would be fairly arbitrary. Also, I wouldn’t want it to get like similar things in other parts of the blogosphere, where makers have to make something for the blogger before they can count. Verry informative, so glad I stumble upon this site. Hello, I just browsed Kent&Haste’s website and they said “However, clients need not restrict themselves to our house style, as both Kent and Haste have the ability to adapt to a customer’s personal vision”. However, Steven Hitchcock’s website says that one should not trust a tailor who claims he can adapt whatever style the customer wants, because a good tailor would only focus on his own house style and does it best. Which claim do you think is true? Thanks. The latter is more accurate. But K&H are also not really saying they can do anything at all. All adaptation has its limits.